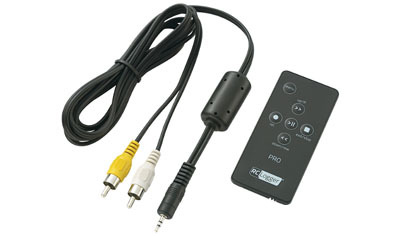 A/V Kit for RC Logger PRO including video/audio cable and IR remote control. The kit is required to operate the camera by IR remote control. A/V Kit for RC Logger PRO including video/audio cable and IR remote control. This kit is required to operate the RC Logger PRO by remote control while connected to an external LCD/TV monitor with A/V input socket. The kit allows users to make configuration changes to the camera including image- and video- options as well as audio bypass, module and PWM setup or date/time stamp options, just to name a few configuration options. Refer to the operating instructions and datasheet for complete product details and a list of all configuration options.